In a hydraulic system requiring a precise control of flow or pressure, an electrohydraulic servo valve would be used. Servo valves use a torque motor to position the valve and are very precise. These valves are typically used in systems that contain little, if any, contamination. The tolerance of the internal valves are so close, any contaminant could severely damage the valve. HyPneu can be used to simulate the performance of an electrohydraulic servo valve using different sets of parameters. 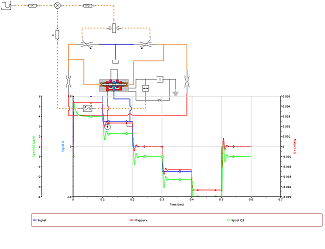 In this schematic, the only data required to simulate the servo valve is the data for the flapper and the spool valve. 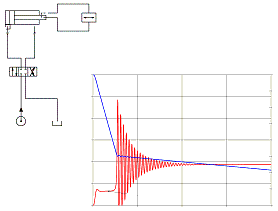 All dimensional parameters of the servo valve are not required to run a simulation using this type of circuit. As can been seen in the schematic, the pressure compensated pump consists of a pumping mechanism, a swash plate, controls, orifices, and a relief valve which control the pressure setting. The pump design shown here can be directly translated into a HyPneu drawing. In order to evaluate this pump through computer simulation, a drive motor and variable loading situations must be added to the circuit. In addition to the HyPneu circuit and simulation results, the simulation would take into consideration both compressibility and the clearance flow between the spear and the cushion cavity. The results represented here principally show the transient response as the dynamic effect—which is due to fluid compressibility in the cushioning chamber which actually occurs in the real life cushioning process. HyPneu is a product of BarDyne, Inc. of Stillwater, Oklahoma U.S.A. Copyright © 2016 BarDyne, Inc. All rights reserved.